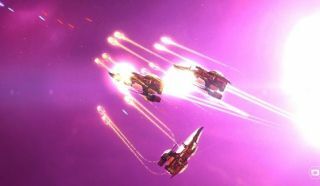 Distant Star: Revenant Fleet is a space RTS set in a randomly generated universe. You fight enemy fleets with lasers and other neat space weapons, and then upgrade said space weapons in the ship customiser between bouts. There are also "ancient graveyard battlefields" and a narrative thread to add context, motivation and a portentous sense of doom to proceedings. I'm reminded slightly of Homeworld, but everything makes me think of Homeworld. It looks as though combat takes place on a single plane with capture points and lots of broken-up superstructures. I like the idea of combining a fast RTS with some FTL-style fleet progression between missions. I also like almost anything in space, so let's enjoy watching lots of things in space in this Distant Star trailer.